On the Cricut Explore™ machine online Design Space™, there are plenty of flower images to choose from and you can not only make flowers from paper but from different materials such as card, felt, fabric and even leather! 1. Sign into your Design Space™ account, switch on the Cricut Explore™ and ensure it is connected either by Bluetooth or USB cable to your pc/Mac. Create a new project. Using ‘insert image’, search for and select the flower images. 2. Pick and resize the images to what you desire. 3. With your chosen First Edition Kaleidoscope paper, cut the images. 4. Shape the flowers fairly tightly using a quilling tool or a pencil and glue the layers together to create the flowers. 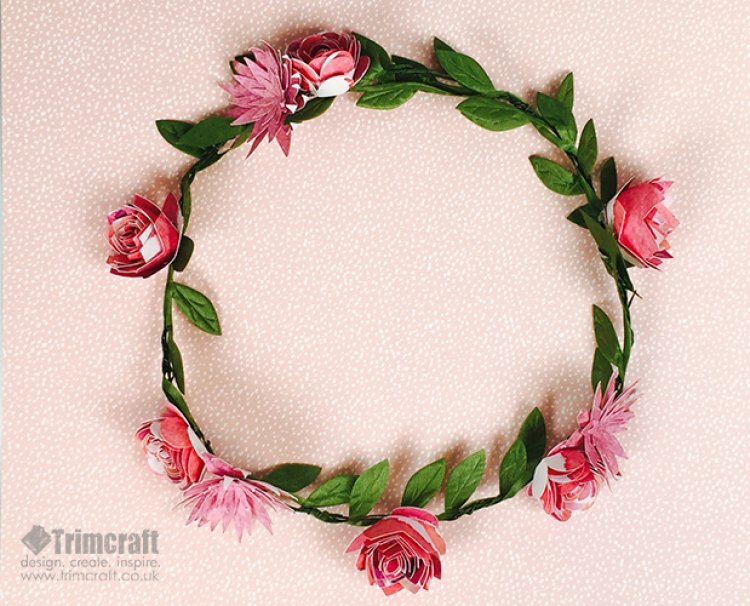 Once dry, attach the flowers to the wire coronet using a hot glue gun. If you have a Cricut Explore™ machine, we would love to see your Cricut Explore™ creations in the project gallery. We have more fun Cricut Explore project ideas in the next few weeks so keep an eye out for them.